Well as there is no Dad's Army this Saturday, here is a little teaser. These are the results of German research in WW2, something that the Allies apparently knew nothing about. I have googled various bits of the answer & there seems to be nothing about this wartime research out in the internet. Well, there is this from Wikipedia about the Junkers Jumo 223 which, according to the heading, is what your experimental performance figures are about. The Junkers Jumo 223 was an experimental 24-cylinder aircraft engine based on the Junkers Jumo 205. Like the Jumo 205, it was an opposed piston two-stroke diesel engine. It had four banks of six cylinders in a rhomboid configuration, with four crankshafts one at each vertex of the rhombus, and 48 pistons. It was designed for a power of 2,500 horsepower at 4,400 rpm, and weighed around 2,370 kg. Only one example is known to have been built. It is rumoured to have been taken to Moscow after the war, where development may have continued. Good bit of googling & although based on Jumo 223 this experiment was on a 1-cylinder engine! Yes Wally, this was what it was all about. It was an attempt to achieve that by a particular means. Not that high up Wally. 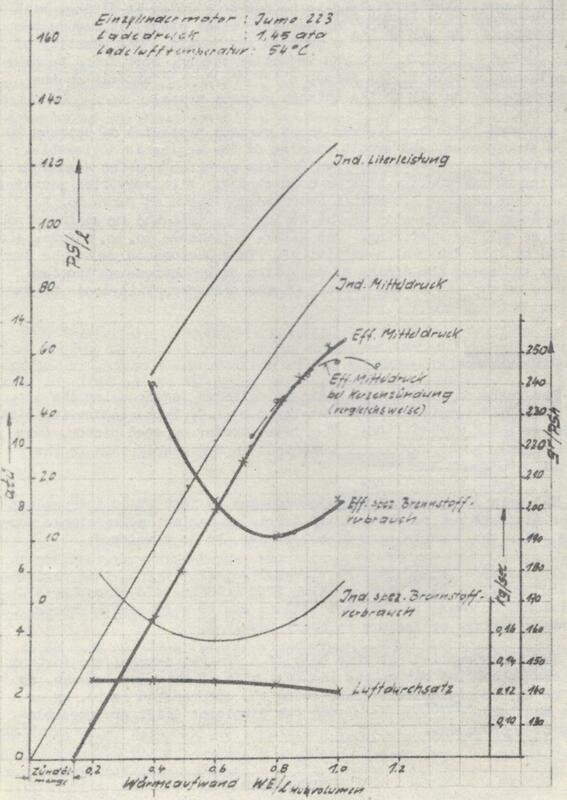 In 1937, a single cylinder test engine of the Jumo 223 design was built, this is the test sheet from it. Good thought Pekka but not that. Richard I can't see the test sheet. I was referring to your illustration, sorry maybe it was not a test sheet, I could only work out that it was a single cylinder! I think the biggest problem with the design was too high a piston speed, leading to piston failures. They were hoping to use it at altitudes at up to about 35,000 feet I think. Ah sorry, this is from a 1945 intelligence report of what was discovered at the Junkers plant in Dessau. It states the single cylinder tests were carried out in December 1944. This particular investigation was not focussed on piston failure, but another issue as "engine outputs were boosted and higher altitudes encountered". Apparently the full size test engines were suffering from crankshaft breakages due to vibration. Is it that the single cyl test engine was used with a turbocharger? Not this particular investigation Wally. Not a turbocharger Richard, does this help? 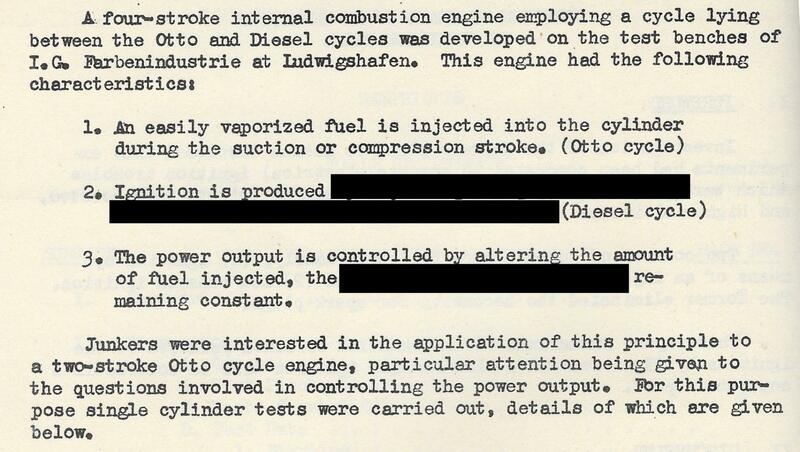 Not really as I would imagine the blacked out phrases would refer to how the injected fuel in to the compressed air created the ignition in a diesel. From the information I have read, the last test of the full size engine was in 1943 and when the Russians captured the factory they conducted two test runs in 1946. Sounds like the ramjet operation on a V1. Actually these engines are the basics of design of the Leyland L60 and Rolls Royce K60 which we know so well. V1 used a pulse jet, nothing like a ram jet.